Surf rolls in majestically while ever-present seagulls dip and soar. The rocky coast of Maine has such incredible surf especially after a storm. You can almost hear it thundering in and feel the ocean breeze in this painting. Pretty rugosa beach roses bloom in the foreground. Painting this scene makes me think of summer as it's snowing again here. I am really looking forward to spring! 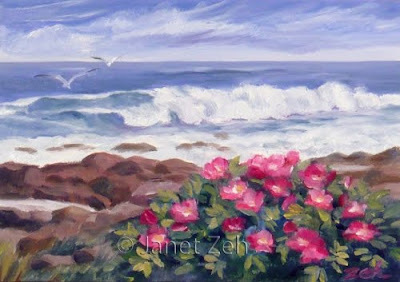 See my seascape artwork for sale at JanetZeh.Etsy.com. Have a great day and please stop by again!